Nigeria will step up their preparations for the 2018 World Cup qualifiers with two international friendly fixtures next month, against Congo and Cameroon in Belgium. The 2013 African champions are to play Congo in Antwerp on 8 October, followed by a meeting with the Indomitable Lions in Brussels three days later. Super Eagles coach Sunday Oliseh sees these two matches as key to getting his squad into shape for the World Cup fixtures against Djibouti or Swaziland in November. 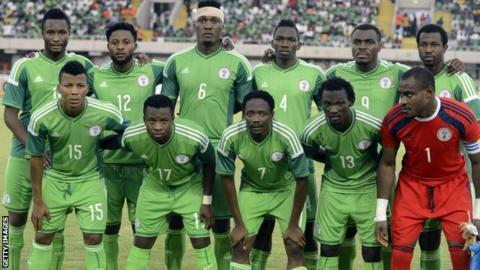 "The coach believes these two matches will give him an opportunity to access his squad and put them in shape ahead of the World Cup qualifiers," NFF spokesman Ademola Olajire told BBC Sport. "With the matches being played in Europe on Fifa official dates against strong opposition, it will enable Mr Oliseh to test his team thoroughly. "The majority of the players are playing in Europe, making it easier for them to travel to Belgium for these matches." Congo denied Nigeria a chance to feature at this year's Nations Cup in Equatorial Guinea, when they finished second behind South Africa in their qualifying group. Nigeria lost 3-2 to Congo in Uyo and avenged this defeat by winning the reverse fixture 2-0 in Pointe Noire, but they failed to beat South Africa in the final qualifier, denying the Super Eagles a chance to seal a ticket to the continental showpiece tournament. The game against four-time African champions Cameroon will be the first meeting between the sides since the Super Eagles beat the Indomitable Lions 2-1 in Monastir at the 2004 Cup of Nations. Meanwhile, the Nigeria Football Federation (NFF) is also considering another friendly against a North African team before they face Egypt in March in continuation of the 2017 Africa Cup of Nations qualifiers. "We are working on a friendly against Tunisia or Algeria before the game against Egypt," said NFF president Amaju Pinnick.